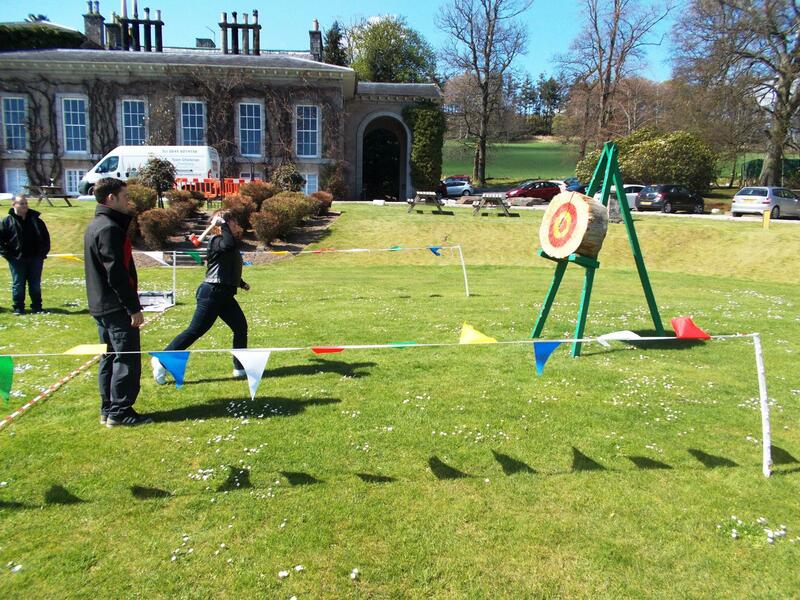 The stunning Turnberry Resort was the setting for an afternoon of exciting Outdoor Team Building, and later an Evening of thrilling Evening Entertainment for the group from Eureka Solutions. After a morning presentation and a lovely lunch, it was straight into full swing with the colour coded teams forming Rocket Manufacturing companies to compete in our Trade to Win Business Simulation. With introductory Business Pitch presentations it was time for the teams to get their thinking caps on (literally!) and present their winning corporate strategy. Following these highly entertaining presentations there was the first opportunity for the teams to earn some money with the Balloon Tower challenge which got things off to a very mixed start haha! Heading outside for the Team Building challenges, it was first off to the Rocket Shop to start building our rocket. Casket Rescue proved to be too much for some of the teams to master so Archery and Laser Clays came as the perfect fun relief to the mind boggling difficulty of this challenge! With the money mounting up and the parts flying off the shelves, the rockets were really beginning to take shape which meant it was soon time for the launch. As each team stepped up the adoring audience was thrilled with the results as all but one rocket flew skywards and managed to get recovered. The less we say about our final rocket the better!!! When it came time for the awards it was Infin- IT that went home with the Wooden Spoon, much to the delight of G-String ladies who were delighted to come 7th. At the other end of the scale it was Galaxy Inc in second place just missing out while the champions were crowned as Rocket Science who were consistent and deserving winners all day. After a quick change into the gladrags we gathered in the stunning Turnberry suite for a sumptuous buffet dinner and some operatic entertainment followed by a presentation by Alistair. It was then time for the fast and furious Race Night which saw the teams get off their seats to prove the louder you cheer the faster your horse runs. When the races were complete it was time to tot up the cash and in the end there could only be one winner and that was Red Rum claiming some champers and chocolate prizes as well as the coveted Team Challenge Company Winner’s Trophy of course! It was then time to put our hands together to thank Alistair and Eileen for putting together another wonderful conference. To finish of the night ion style everyone hit the dancefloor to dance the rest of the night away with a fantastic Disco.